2018 and everyone is back at work. A new year means a fresh start therefore I can't stop thinking about an updated workwear wardrobe. I am not a conventional workwear person, I prefer blazers over thirts or silk shirts with jeans. However, I adore skirts and find that the right skirt have the power to change/elevate your work outfit. I have been eyeing this Altuzarra skirt for a long time (almost a year!) and finally bought it when it appeared on TheRealReal. What caught my eyes about this fantastic skirt is the perfect khaki green shade and the versatility. The skirt has a perfect balance of work appropriate and dinner ready. 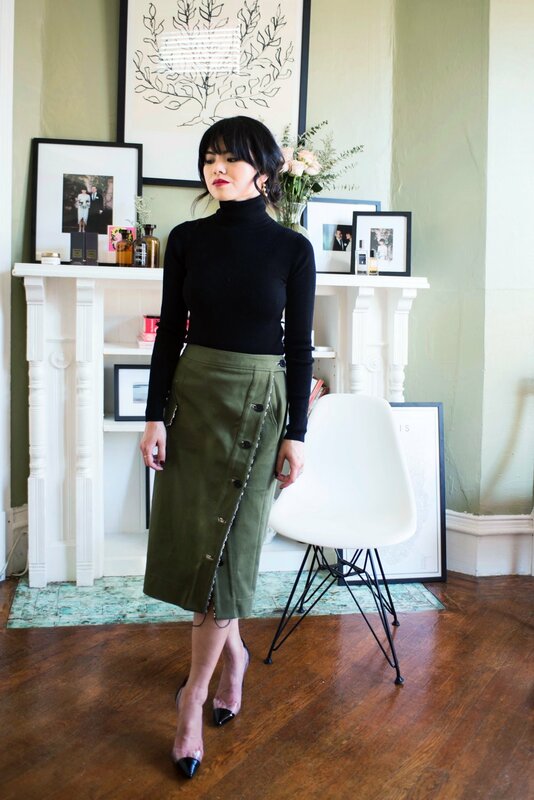 I love styling this skirt with a good black turtleneck top. For warmer days, I would pair it with a camisole or a white t-shirts or simple blouses. The options are endless. Worn here with Manolo Blahnik heels (similar style here) and Muji ribbed turtleneck sweater (similar here). Photos by Angie Silvi, Styling by me.